Our Special Focus for August 2013 looks at the growing crisis in local services. Click here to read it. Ludlow’s new hospital is in doubt. There is a budget shortfall of more than £1 million and the project may be cancelled. The Shropshire Clinical Commissioning Group is holding an extraordinary Broad meeting at 9am on 21 August at Ludlow Racecourse. Town buses services are to be halved. The present four services will be reduced to two, with longer less frequent journeys. Coder Road recycling is under threat of closure after a petition signed by 2,000 town residents pleading for it to be kept open is ignored. The Link rural bus service that services villages and hamlets across the county is to be scrapped on 5 October. There is unlikely to be an immediate replacement. Sunday park and ride. Remember that promise during the elections earlier this year? A new Sunday bus service was to be paid for by Ludlow’s controversial parking charges. There’s not been a mention of it since. Open democracy has all but been abandoned by Shropshire Council and now single councillors make many decisions on local services behind closed doors. Development. Shropshire Council has changed its mind about housing and employment plans for Ludlow. It now wants housing and more industrial development between the A49 and Sheet village. Its consultation closes on 24 August. 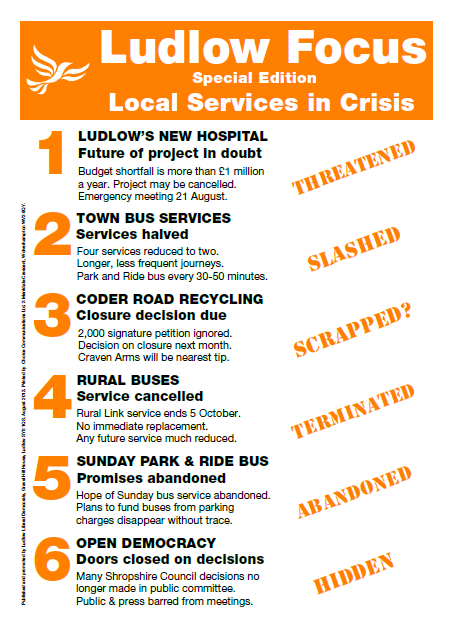 Click here to read more about the crisis in Ludlow’s local services.